Some commentators have compared the victory of the “Oxi” at the Greek referendum of July 5th to a Pyrrhic victory, implying that while the anti-austerity camp won this battle, it is doomed to lose the war, strangled by the insurmountable economic difficulties caused by the lack of liquidity. Others have suggested that the referendum looked like the Thermopylae battle of 480 BCE, where three hundred Spartans valiantly fought the Persian army and lost. A better comparison, however, in my judgment is that with the Battle of Marathon. In 490 BCE, after failing to persuade other Greek cities, and especially Sparta, of the necessity to unite against the threat of the first Persian invasion, Athens decided to confront the Persians with the only help of its small ally, Plataea. 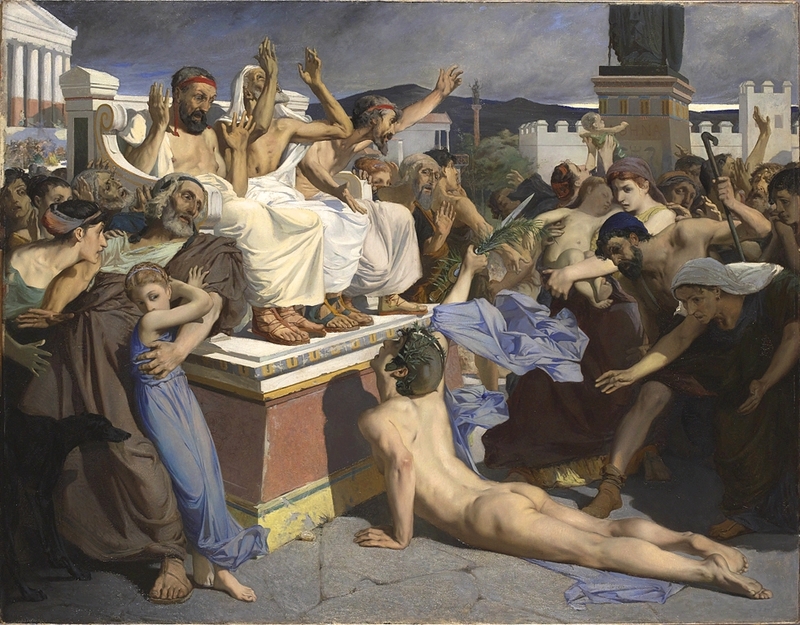 10,000 Athenians and Plataeans confronted at Marathon a much larger army, of at least 25,000 Persians. The 10,000 hoplites were everything Athens had: losing the battle would have likely meant the fall of Athens. Miltiades gave them the signal to attack in spite of their numerical disadvantage. They fought, and they won: the Persian invasion was over, and Athens came to be celebrated in the subsequent years as the liberator of Greece from Persian tyranny and as the herald of freedom. Later, in his Histories, Herodotus wrote that its democratic regime made Athens’ greatness. While the outcome of the confrontation between Greece and European institutions is still uncertain, 61.3% for the “no” is not just the victory of a battle, but that of an important war. No measure of further harassment by the European institutions will manage to delete the significance of this victory. The “no” vote has shown that the emperor has no clothes. It has revealed the heart of this European Union for the way it has been realized: a dark and ugly. No amount of future cosmetic adjustment will manage to give back political and ethical legitimacy to this kind of European Union. Regardless of the outcome of the next days of confrontation, Greek people have given European people and governments a lesson of democracy, dignity, and bravery that will be hardly forgotten. 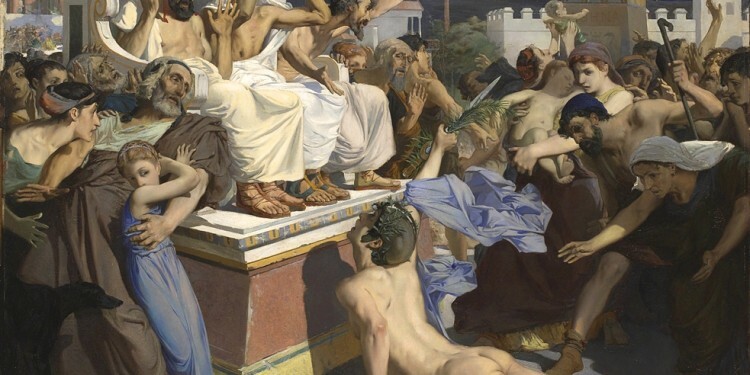 In a New York Times article, Robert Zaretsky compared the negotiations between European institutions, the IMF and the Greek government to Thucydides’ Melian debate. The sense of the comparison was to emphasize the astonishing display of hubris on the side of the lenders. After five months of negotiations in which the Greek government came to concede so much ground that the potential final agreement (including the rejected Greek emendations) had very little to do with Syriza’s Thessaloniki Program and popular mandate to end austerity, it appeared clear that no measure of capitulation on the part of the Greek government would ever be sufficient to the lenders. What they wanted was Syriza’s political humiliation, as well as the humiliation of an entire people, the people that had the audacity to fight the dogma of austerity during long years of powerful social mobilization. The paradoxical nature of these negotiations emerged even more clearly a few days after Tsipras’ decision to call a referendum, when the IMF published a report explicitly declaring the unsustainability of the Greek debt. The Greek government had kept asking for significant debt relief, given that the harsh austerity policies imposed by the Memoranda not only increased the debt at skyrocketing levels, but pushed Greek economy toward recession, making insolvency the unavoidable outcome, while at the same time creating mass unemployment and poverty. This repeated request was met with resistance if not ridicule, and any discussion about debt relief was either excluded or postponed: the Greek government had to implement yet another program of socially unbearable austerity measures first. We have considerable doubts about the feasibility of the program…We have doubts on the growth assumptions, which seem to be overly benign. Even a small negative deviation from the baseline growth projections would make the debt level unsustainable over the longer term…Why has debt restructuring and the involvement of the private sector in the rescue package not been considered so far? In 2013, the IMF candidly admitted that, indeed, they had significantly underestimated the damages that austerity policies would cause to the Greek economy: instead of recovering, the country had entered into its fifth year of recession and the economy had contracted by 17% instead of the programmed 5.5%. Moreover, they warned that the debt might be unsustainable. Nonetheless the IMF continued with the same strategy. It has […] come to the understanding of the Committee that the unsustainability of the Greek public debt was evident from the outset to the international creditors, the Greek authorities, and the corporate media. Yet, the Greek authorities, together with some other governments in the EU, conspired against the restructuring of public debt in 2010 in order to protect financial institutions. The corporate media hid the truth from the public by depicting a situation in which the bailout was argued to benefit Greece, whilst spinning a narrative intended to portray the population as deservers of their own wrongdoings. The European institutions’ attitude may appear irrational, but in fact it is not. While we may characterize the austerity program as a failure from the viewpoint of the effects on Greek recession, the European institutions’ aim has never really been Greek recovery. First of all, less than 10% of the total bailout money of 2010 and 2012 was used by the Greek government to reform its economy: most of the money came back — in the form of repayment of debts and interests — to the banks that lent Greece before the crash. As emphasized by the Greek Debt Truth Commission, contrary to the myth propagated by European media that European tax-payers’ money was going to finance the laziness and dolce vita of Greek people, the bailout was essentially destined to German, French, and Italian private banks. This is a precise political-economic choice on the side of European institutions: protecting the European financial sector. Secondly, through austerity, European institutions managed to transfer the burden of the consequences of the economic crisis from those who were actually responsible for it to popular strata all over Europe: this is again a precise political-economic choice. Finally, European institutions have a more directly political reason for inflexibility: the fear that opposition to austerity may spread across Europe. Brutal social and economic measures were imposed upon Baltic and East-European countries — where Germany has vested economic interests — as a precondition for joining the EU. Showing flexibility towards Greece may have opened Pandora’s box and create turmoil between the strongest European economies and their economic satellites. An analogous fear applies to the case of Ireland, which had to go through a brutal adjustment program after the crash: it is not by chance that mainstream media created the myth of the contrast between the diligent and virtuous Ireland and the lazy and parasitic Greece. Moreover, a victory of the Greek government in its fight against austerity would certainly galvanize Podemos in Spain, creating further momentum for anti-austerity positions in the country. If European institutions and IMF had been slightly less inflexible during the negotiations, they may have reached an agreement with Tsipras, which, far from being a “honorable compromise,” would have not marked any real discontinuity with the previous Memoranda. Pushed to a corner by the Troika’s, and especially German government’s, intransigency and hubris, Tsipras had no other choice left but to turn to the Greek people. While the European institutions likely thought that they would be able to force Syriza’s government to a humiliating capitulation without any significant resistance, Tsipras’ move suddenly opened a new social and political space. This explains the European governments’ hysterical reaction: a combination of cries of outrage, insults, political intimidation, intrusion into Greek democratic processes, and paradoxical accusations of absence of a democratic culture addressed to the Greek government. All of this amplified by a massive media campaign, which was not ashamed to systematically resort to open lies. Most importantly, European institutions resorted to what Varoufakis has emphatically called “financial terrorism,” a definition that European governments perceived as an unacceptable insult, but that is actually close to the truth. Forcing the Greek government to close the banks and to establish capital control intended to create a climate of fear and insecurity, which international mainstream media inflamed with their one sided reports. Major newspapers and TV channels went so far as to risk appearing utterly ridiculous, for example, when they reported that the demonstrations of July 3rd for the two camps were of similar size, amounting to 20,000-25,000 people each: a statement immediately refuted by the images of the massive demonstration for the “no” in Syntagma Square, which widely circulated on the web. All the pressure from officialdom, European and international, the banks and the media was not sufficient to bend the majority of the Greek people. Their clear victory in the war for political (and ethical) legitimacy, indeed, reminds me of the ancient battle of Marathon. While I am writing, it is still unclear how the situation will evolve. But the results of the Greek referendum are a call to the whole anti-austerity left in Europe. A call to regain confidence, not only in itself, but — most of all — in the exploited and in the oppressed. It is now the European left’s turn to answer this call. No Muslim Ban Marches in D.C.
Assistant Professor of Philosophy at the New School for Social Research.